Location: The reserve is located in Franklin County, on the Florida panhandle, approximately 90 miles southeast of Tallahassee and 80 miles east of Panama City. Apalachicola Bay is one of the most productive estuarine systems in the Northern Hemisphere. The reserve protects the region’s biological diversity, as well as the economic value of the natural resources and pristine conditions. Between 60 to 85 percent of the local population make their living directly from the fishing industry, most of which is done in reserve waters. Seafood landings from the Apalachicola Reserve are worth $14-16 million dockside annually. At the consumer level, this represents a $70-$80 million industry. Understandably, research projects that target commercial fisheries management and the food chain are a high priority in the Apalachicola Reserve. 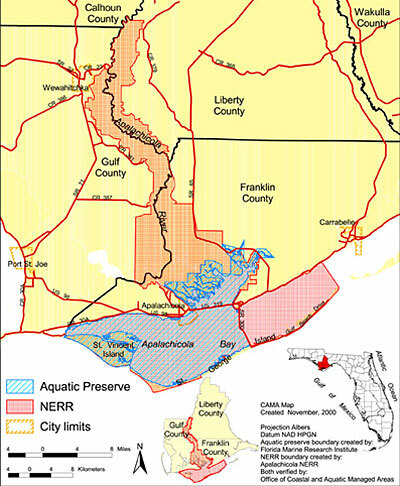 In addition to its water quality monitoring program, the reserve has engaged in extensive benthic habitat mapping in Apalachicola Bay and has a highly sophisticated geographic information systems (GIS), which is used to educate coastal managers and visiting researchers about the area and its ecology. Other educational offerings include ongoing guest lectures for the community and coastal management workshops for environmental professionals. The reserve's K-12 educational activities are divided between classroom and on-site programs. The Apalachicola Estuary is a lagoon and barrier island complex. It has been classified as a shallow coastal plain estuary oriented in an east-west direction. Because of the placement of the barrier island complex, it could be called a coastal lagoon. The Apalachicola Reserve's habitats include barrier island, estuarine, riverine, floodplain and upland environments. Major estuarine habitats found within the reserve include oyster bars, submerged vegetation, tidal flats, soft sediment, marshes and open water. Upland habitats include sandhills, coastal scrub, pine flatwoods and mixed hardwood communities. Wetland habitats include fresh water marsh, salt marsh, riverine, lacustrine, palustrine, open bay and the Gulf of Mexico. Finally, the floodplain forest of mixed hardwoods, tupelo-cypress with mixed hardwoods, pine and mixed hardwoods and willow thickets create some of the most pristine bottomland forests in the southeastern United States. Major vegetative communities on the islands include beach/dune, slash pine flatwoods, oak-rosemary scrub and tidal marsh.